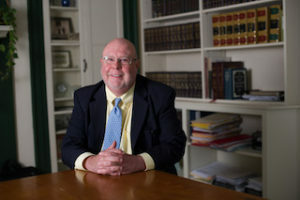 Cramer & Anderson Partner Dan Casagrande is officially the “Giant Slayer” among Connecticut attorneys. On March 23, the Connecticut Law Tribune (CLT) announced Attorney Casagrande as the only winning attorney in a new category added this year to the statewide Professional Excellence Awards. The award, one of four for Cramer & Anderson attorneys this year, was based on a nomination letter submitted by Partner Ken Taylor. Cramer & Anderson Partner Dan Casagrande is at it again—going up against another “giant,” with right on his side, as usual, but not might, at least not in the sense of his firm’s size, or having a legion of attorneys at his side. Attorney Casagrande has attributes you can’t teach, or buy. Working collaboratively with longtime law partner Attorney Kim Nolan, he sees the truth of the matter, relentlessly mines for decision-shaping evidence and interpretations, and knows how to present cases in ways that mitigate the magnitude of opponents. The current towering foe is the Connecticut Siting Council, which recently approved a large energy project laced with environmental threats over the objections of citizens, officials and even state agencies. To prevent mature forestland from being clear-cut to make way for Connecticut’s largest solar power farm, an opposition group turned to Attorney Casagrande because of his long and impressive track record of cutting giants down to size. One signature example is the 1998 Union Carbide appeal of the municipal tax assessment valuation of its Danbury, Conn., headquarters, equating to a $307 million market value. As outside Assistant Corporation Counsel, Attorney Casagrande represented the City of Danbury, and Union Carbide retained one of the best tax lawyers in the state, if not the country. The trial court upheld the City’s valuation after a 24-day trial, Union Carbide appealed, and Attorney Casagrande ultimately prevailed before the Connecticut Supreme Court, safeguarding $10 million in tax revenue for the City. Because of that success, the Town of Waterford retained Attorney Casagrande when Dominion Nuclear Connecticut, Inc., owner of the Millstone Nuclear Power Station, appealed the town assessor’s $1.2 billion valuation of Millstone for tax purposes. Attorney Casagrande went up against a law firm with more than 400 attorneys in offices from Boston to Washington, D.C., and after a four-year battle and a 24-day bench trial the court preserved 93 percent of the town’s valuation. It’s believed to be the largest assessment appeal litigated in Connecticut. “If the town lost that case, it could have gone bankrupt,” Attorney Casagrande reflected. Another Danbury case still makes him proud. In the mid-1990s a major developer was allowed to begin site work for high-end condos on municipal redevelopment property before obtaining title or financing. After making $7 million in improvements, the developer couldn’t get financing. The City terminated the redevelopment contract and legal action ensued. In the end, an arbitration panel awarded the developer $0. “He took a risk and lost,” said Attorney Casagrande. The examples go on, and they support a cautionary thought for corporations, developers and big law firms: going up against Attorney Casagrande is taking a risk—because he is one of the most powerful giant slayers in Connecticut. Attorney Casagrande is joined on the list of winners by Partner D. Randall DiBella, who was honored with a Best Mentors award, and Attorney Christopher Sochacki, who won a Distinguished Leaders award. Attorney Casagrande’s primary Practice Areas include Land Use & Environmental Law, Municipal Law, and Planning & Zoning Land Use issues. He has served as an outside Assistant Corporation Counsel for the City of Danbury from 1990 through the present.